The best Android and iOS privacy app is available FREE for the next 7 days ($40 value)! Today we’re unveiling a powerful new privacy app exclusively for Samsung and Apple devices. 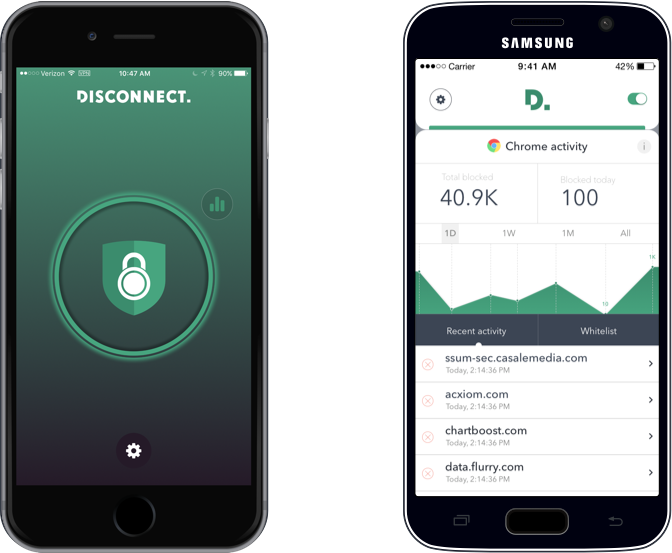 Disconnect Pro empowers you to control your privacy and the performance of your device like never before. Disconnect Pro gives you the ability to block and visualize tracking across your entire device, protecting you inside all the apps and browsers you use. Preventing this unwanted data collection not only protects your privacy and security, but accelerates page and app loads by up to 44%, reduces cellular data waste by up to 39% and increases your battery life depending on your usage. Our Pro app makes your entire Samsung or Apple device safer, faster, and better! Disconnect Pro for Samsung also shows you what apps are the source of privacy invasive tracking. This unique feature is exclusive to our Pro app for Samsung. Since we do not make money serving you ads or collecting your data in our app, we charge a one time fee of $40 for this valuable product but for the next week (until September 28, 2016) we are offering users Disconnect Pro free. Get it now!